Kyabje Dudjom Rinpoche or Dudjom Jikdral Yeshe Dorje (Tib. བདུད་འཇོམས་འཇིགས་བྲལ་ཡེ་ཤེས་རྡོ་རྗེ་, Wyl. bdud 'joms 'jigs bral ye shes rdo rje) (1904-1987) — one of Tibet’s foremost yogins, scholars, and meditation masters. He was recognized as the incarnation of Dudjom Lingpa (1835-1904), whose previous incarnations included the greatest masters, yogins and panditas such as Shariputra, Saraha and Khye'u Chung Lotsawa. Considered to be the living representative of Padmasambhava, he was a great revealer of the ‘treasures’ (terma) concealed by Padmasambhava. A prolific author and meticulous scholar, Dudjom Rinpoche wrote more than forty volumes, one of the best known of which is his monumental The Nyingma School of Tibetan Buddhism: Its Fundamentals and History. Over the last decade of his life he spent much time teaching in the West, where he helped to establish the Nyingma tradition, founding major centres in France and the United States. His Holiness Dudjom Rinpoche, Jikdral Yeshe Dorje, was one of the most outstanding yogins, scholars and meditation masters of recent times, who inspired not only awe in those who met him, but also devotion and deep affection. After the flight of the Tibetans into exile, it was Dudjom Rinpoche who was the first master to be accorded the title of Supreme Head of the Nyingma School of Tibetan Buddhism, the ‘oldest’ school introduced into Tibet in the 8th century by Guru Padmasambhava. Dudjom Rinpoche was born in 1904, into a noble family in the south-eastern Tibetan province of Pemakö, which is one of the four ‘hidden lands’ of Padmasambhava. He was recognized as the incarnation of Dudjom Lingpa (1835-1904), a famous tertön or discoverer of concealed ‘treasures’ (terma), particularly those related to the practice of Vajrakilaya. Dudjom Lingpa had intended to visit southern Tibet to reveal the sacred land of Pemakö, but as he was unable to do so, he predicted that his successor would be born there and reveal it himself. In his youth, Dudjom Rinpoche studied with some of the most outstanding masters of the time. He began his studies with Khenpo Aten in Pemakö, before attending some of the great monastic universities of Central Tibet—such as Mindroling, Dorje Drak and Tarjé Tingpoling—and East Tibet—such as Kathok and Dzogchen. But it was to Mindroling that he returned to perfect his understanding of the Nyingma tradition. Foremost among his many teachers were Phungong Tulku Gyurme Ngedön Wangpo, Jedrung Trinlé Jampa Jungné, Khenchen Jampal Dewe Nyima and Minling Dordzin Namdrol Gyatso. Dudjom Rinpoche's main area of activity was in Central Tibet, where he maintained the Mindroling tradition, and especially at Pema Chöling and his other seats in the Kongpo and Powo regions of southern Tibet. He became renowned throughout Tibet for the depth of his realization and spiritual accomplishment, as well as for his unsurpassed scholarship. Unique in having received the transmission of all the existing teachings of the immensely rich Nyingma tradition, Dudjom Rinpoche was especially renowned as a great tertön, whose termas are now widely taught and practised, and as the leading exponent of Dzogchen, the ultimate teaching within Tibetan Buddhism. Above all else, he was regarded as the living embodiment of Padmasambhava, and his representative for this time. A master of masters, he was acknowledged by the leading Tibetan teachers of his time as possessing the greatest power and blessing in communicating the nature of mind, and it was to him that they sent their students when prepared for this ‘mind-direct’ transmission. In fact, Dudjom Rinpoche was the root teacher of many of today's most prominent masters. He was no less famous as an author and a meticulous scholar. His writings are celebrated for the encyclopaedic knowledge they display of all the traditional branches of Buddhist learning, including poetics, history, medicine, astrology and philosophy. A writer of inspirational poetry of compelling beauty, he had a special genius for expressing the meaning and realization of Dzogchen with a crystal-like lucidity. Amongst the most widely read of his works are the The Nyingma School of Tibetan Buddhism, Its Fundamentals and History; which he composed soon after his arrival in India as an exile and which is now available in English translation. This monumental history of the Nyingma School is a masterpiece which presents, for the first time, a great deal of new material on the development of Buddhism in Tibet, and will remain the authoritative work on the subject. At the invitation of His Holiness the Dalai Lama, Dudjom Rinpoche also wrote a history of Tibet. Another major part of his work was the revision, correction and editing of many ancient and modern texts, including the whole of the Canonical Teachings (kama) of the Nyingma School, a venture he began at the age of 74. His own private library contained the largest collection of precious manuscripts and books outside Tibet. After leaving Tibet, Rinpoche settled first in Kalimpong, in India, and later in Kathmandu, Nepal. At a time when it seemed threatened with extinction, he played a key role in the renaissance of Tibetan culture amongst the refugee community, both through his teaching and his writing. He established a number of vital communities of practitioners in India and Nepal, such as Zangdok Palri in Kalimpong, Duddul Raptenling in Orissa, and the monasteries of Tso Pema Orgyen Heruka Nyingmapa Gompa in Tso Pema, and Dudjom Gompa in Bodhnath. He actively encouraged the study of the Nyingma Tradition at the Central Institute of Higher Tibetan Studies in Sarnath, and continued to give teachings according to his own terma tradition, as well as giving many other important empowerments and transmissions, including the Nyingma Kama, the Nyingma Tantras (Nyingma Gyübum) and the Treasury of Precious Termas (Rinchen Terdzö). When Dudjom Rinpoche was eight years old, he began to study Shantideva's Bodhicharyavatara with his teacher Orgyen Chogyur Gyatso, a personal disciple of the great Patrul Rinpoche. When they had completed the first chapter, his teacher presented him with a conch shell and asked him to blow it towards each of the four directions. The sound it made to the East and to the North was quite short, in the South it was long, and in the West longer still. This was to be an indication of where his work in later times would be most effective. Kham, in the east of Tibet, had been the birthplace of Dudjom Lingpa, who had already been very active in that region. In the South, throughout the Himalayan regions of Bhutan, Sikkim, Nepal and Ladakh, Dudjom Rinpoche had many thousands of disciples; when, on one occasion, he gave teachings in Kathmandu intended only for a few lamas, between twenty-five and thirty thousand disciples came from all over India and the Himalayas. In the final decade of his life, in spite of ill-health and advancing years, he devoted much of his time to teaching in the West, where he successfully established the Nyingma tradition in response to the growing interest amongst Westerners. He founded many major centres including Dorje Nyingpo and Urgyen Samyé Chöling in France, and Yeshe Nyingpo, Urgyen Chö Dzong and others in the United States. During this historic period, he tirelessly gave teachings and empowerments, and under his guidance a number of Western students began to undertake long retreats. Dudjom Rinpoche also travelled in Asia, and in Hong Kong he had a large following, with a thriving centre which he visited on three occasions. In 1972, 1976 and 1979 he visited London at the invitation of Sogyal Rinpoche, who travelled with him during his tours of the West as his translator and aide. In 1979 he spent the whole month of May at the centre of Dzogchen Orgyen Chöling in north-west London, which was later to become Rigpa. 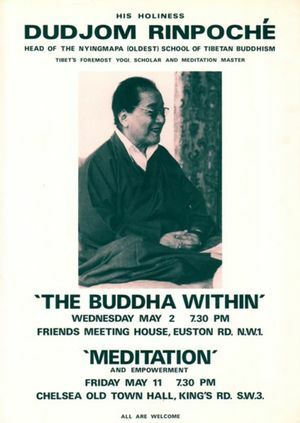 He gave public talks, empowerments and teachings in central London, and special Dzogchen instructions to small groups. It was at this time that a unique 16mm. film was made of him teaching and practising meditation. Over the years that followed, Dudjom Rinpoche conducted a number of summer retreats at Urgyen Samyé Chöling in France. Eventually, `the wanderer, Dudjom’, as he sometimes used to sign himself, settled with his family in the Dordogne area of France, and there in August 1984 he gave his last large public teaching. Dudjom Rinpoche was undoubtedly a fully realized master, yet, every day he would rise hours before dawn in order to practise; in the mornings he would pray for all those who had taken refuge in him, and in the evenings for those who had died. Continually he prayed that all those who saw him, heard him, came in contact with him or even thought of him would be freed from suffering. He always made a point of being accessible to people from all walks of life, and anyone who had the good fortune to meet him could not fail to be touched by his warmth, simplicity and vivacious sense of humour, as much as they were awed by his presence, deep wisdom and vast learning. Dudjom Rinpoche was a householder, a yogin with a family and married twice. He had seven children from his first marriage, and four from his second. Semo Dechen Yudron, their eldest daughter, who stayed in Lhasa, and who took care of Dudjom Rinpoche's seat, Lama Ling, in Kongpo. Tsering Yangchen, their younger daughter who passed away when she was young. Dekyong Yeshe Wangmo, their first daughter, was recognized as an incarnate dakini and was believed to be an emanation of Yeshe Tsogyal, but died when she was a young woman.